Grayson County High School art teacher Jane Blevins turns students’ pondering questions into still-life answers by painting a watercolor series of campus scenes that reflect college and local high school experiences. Her new series of high school-themed art prints illustrate graduates wearing gowns on each local school’s campus. Blevins has set up a scholarship drive that uses proceeds from each high school print sold to raise money to send a child to art school in Abingdon. Blevins hopes to raise enough money to sponsor one child each from Galax, Grayson County and Carroll County. Blevins received a bachelor’s degree in history at Emory & Henry College and a master’s degree in art education from Radford University. She is an avid Virginia Tech fan. Daughters Samantha and Stephanie earned degrees from Tech. Taking into account her experience as a teacher, college student, mother and fan, Blevins knows what it’s like for high school students to have plenty of critical questions and concerns before setting foot on campus at their dream school. “This is a time when students are making decisions about college, so I like to do visuals of all the discussions and specifics,” said Blevins, who teaches art to juniors and seniors at GCHS. Blevins quizzes students about college essentials, asking questions such as “What is the mascot of Emory & Henry?” and implements the answers into watercolor paintings. Sometimes she gets phone calls or requests to put certain college campuses into a take-home product. Her paintings are a collection of still-lifes that represent the appearances and spirit of campuses such as Radford University, Virginia Tech, East Tennessee State University, West Virginia University, Emory & Henry, Wytheville Community College, the University of Virginia, Wake Forest University and other regional colleges. In several college paintings, such as RU’s “Highland Heritage” or “Tech Spirit” wine bottles, books and glasses are clustered together on a table, and each bottle label is accented with images of college campus buildings. Blevins is such a huge VT fan that she gets most of her inspiration from the university. Her basement walls are covered with orange and maroon Hokie scenes. In attending almost every football game at Tech, Blevins walks around campus to get an understanding of college life and to find feelings that inspire new ideas. She photographs any image that could perhaps be the next painting. She’s reminded of the excitement of football games, meeting people at tailgate parties and the strange emotions she felt after being on a silent, somber campus just days after the Virginia Tech massacre in 2007. In "Game Day," a football rests beside a wine bottle with a decorative label, which reflects the VT campus. After meeting football coach Frank Beamer, he autographed the football on the original painting. One scene depicts Beamer as a young football player, dressed in a football uniform and carrying his helmet. Blevins got her nephew to pose for the picture. Several of her paintings include her daughters and other children posing for pictures, such as “Tech Girl,” which represents one of her daughters wearing pig tails and hiding her face behind a giant orange and maroon lollipop. Blevins is passionate in her feel of bright colors. She recalls her artistic, rambunctious childhood, when she left behind paint spills and painted walls for her mom to clean up. Seeing herself as a teacher instead of an artist, Blevins rarely sold any of her art. That is, up until three years ago. Three years ago, Blevins handed an image to her husband, Sam, a retired state trooper who died in 2007. A painted image showed young boys with a bicycle looking over the railroad trestle. Sam thought it was so beautiful that he took it to have prints made. “I wouldn’t have started selling my art if it weren’t for him,” said Blevins. Two years ago, Blevins captured a brief photographic idea that got her a few minutes of television fame on WDBJ7. While at a Virginia Tech football game, Blevins saw a young girl named Audrey sporting a maroon and orange cheerleading outfit and prissily tossing and dancing around in a ruffled, feathered orange and maroon boa. Always looking for new ideas for her series of water-color college paintings, and after asking for Audrey’s mother for permission, Blevins snapped a photo. She walked away and Audrey became lost in the crowd before Blevins remembered to ask for the girl’s full name. After Blevins painted the image of Audrey, she knew she had only a small chance of finding the little girl, but decided to give it a shot. She called the television station and it aired Blevins’ concern about wanting to find Audrey to give her a copy of the painting. Soon, the phone soon rang. Audrey lived only a few miles away in Wytheville. When Blevins showed up at Audrey’s door, Audrey was decked out in her cheerleading costume and presented Blevins with flowers. “The thing I enjoy most is sharing my art and watching people respond or smile,” she said, in describing what it means to be an artist. Blevins revealed some of her memorable moments. After the Virginia Tech shootings last year, Blevins painted an image of victims Emily Hilscher, Matthew La Porte and Ryan Clark and received a strong reaction from all their families. Blevins attended Tech’s cadet dinner, where an honorary diploma, class ring and the painted image were presented to La Porte's family. And when Blevins presented the painting to Hilscher's family, they gripped Blevins in a tight hug and wept of joyous memories of Emily. “If I see that a painting makes a connection with people, that’s a good thing. As an artist and teacher, Blevins claims that she has one of the best careers possible — inspiring students to release their creativity. She calls her skill a learning process by which she passes knowledge on to her students. Blevins could have retired three years ago, but instead remains on the move, always maintaining a tight, busy schedule. During the day, she teaches art to high school students. By night, she instructs an aerobics class at the Wellness Center in Galax and works hours on her paintings. And now Blevins is creating illustrations for the children’s book “What’s a Hokie, Mommy?” that will feature some of Blevins’ VT prints. The book is in partnership with her friend and retired English teacher Candy Reedy, and is expected to be completed and printed by June. Blevins’ artwork can be purchased at several local galleries, such as The Framer’s Daughter, New River Florist, Grayson Florist and Back Porch Gallery. It is also on display at Bogeys Restaurant in Galax. For more information and a complete list of prints, see janeblevinsart.com or call 233-9590. The college football season may be over, but that isn't stopping one Virginia Tech fan from keeping the sport alive through art. 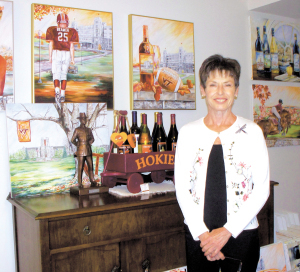 Jane Blevins is a Grayson County native who loves the Hokies so much she's painted several scenes of Virginia Tech. One of those scenes includes one of coach Frank Beamer as a young boy. We understand Coach Beamer likes her work so much he autographed one of her original paintings. Another print is titled "Are those my feathers?" which displays the team spirit at Virginia Tech. The little girl featured in the painting is a child who was photographed before a Duke game at Lane Stadium. Blevins did not get the girl's name and she would like to locate her family and give them a copy of the print. In all, Blevins sells five prints of Virginia Tech themes. She's also branched out to other schools. Galax artist Jane Blevins displays her school pride (and yours, too) on colorful canvases. For the man or woman who has everything Hokie or 'Hoo, a Galax artist has come up with a new gift idea. Jane Blevins has begun a series of still-life paintings that reflect regional colleges and is selling prints of them in art galleries from Roanoke southward. Completed so far are "Tech Spirit" and "The University," and she's putting the finishing touches on "Mountain Pride" for West Virginia University. The inspiration came from 30 years of teaching art to Grayson County middle and high school students and watching those students set their sights on college -- often as the first member of their family to attend. That, combined with Blevins' lifelong fascination with painting reflected light, led to "Tech Spirit." In the painting, wine bottles and glasses are clustered on a table before a background dominated by reds and Hokie maroons and oranges. Each label bears the image of a Tech architectural icon and an adjective meant to suggest what the building represents. They are Lane Stadium, labeled as "spirit;" the War Memorial ("honor"); Burruss Hall ("tradition"); and Cassell Coliseum ("victory"). Despite having painted since she was a child, Blevins, 54, considered herself "just an art teacher" rather than an artist, and rarely sold her work. "I sold a couple of pieces when I was younger," she said, "but then I wanted them back." Husband Sam Blevins, a retired state trooper, believed his wife's work deserved a larger audience. In May, she gave him a painting of two little boys with a bicycle looking over the railroad trestle at Fries. "Sam said, 'This is beautiful,' and I said, 'You can have it.' "
Her husband takes up the tale: "I said, 'If this painting is mine, I'm going to have a few prints made' ... A couple of them sold and that's when Jane got interested." "Tech Spirit" was Blevins' first venture into the retail side of art. "It took me all summer to do," she said. "Mountain Pride" rests nearly finished on an easel nearby. "Tech Spirit" was followed by "The University," with a more subdued color scheme and strong hints of UVa's orange and blue. "I added the books and the glasses to make it more scholarly, hit the mood of the university," Blevins said. She finished that painting in August and had started on Wake Forest when Roanoke gallery owner Randy Burkett asked her to do West Virginia University. She started on that in October. She still plans to do Wake Forest; Radford, where daughter Samantha graduated and Blevins earned her master's degree; the University of Tennessee; and perhaps the Appalachian School of Law. College Art, the Blevins's' new business, offers signed lithographs, archival-quality limited edition prints on watercolor paper, and canvases that resemble real oil paintings. Galleries retail the work unframed for about $45 to $400 depending on size and format. Sharpe Images of Winston-Salem, N.C., has helped with marketing, but Sam Blevins is the family salesman. Two days a week, he makes the rounds of galleries. The work is in 19 Southwest Virginia outlets including galleries in the Roanoke and New River valleys and at Smith Mountain Lake. Charlottesville is on his to-visit list, he said, and, "I guess soon I'll have to go into West Virginia." The original paintings of "Tech Spirit" and "The University" are on display at the Galax Public Library. The Blevins's can be reached at 236-7428 or janeblevinsart@comcast.net.